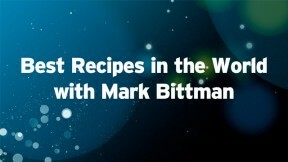 Join best-selling author and New York Times columnist Mark Bittman as he travels across the United States and Europe in search of the world’s best food. The irreverent and opinionated Bittman — host of the award-winning How to Cook Everything series — teams up with superstar chefs including Mario Batali, Gary Danko and Fergus Henderson to create an array of delectable dishes. Cooking and exploring in locations ranging from a country farm house in Tuscany to the chilly fishing waters off of England, the gruff but lovable Bittman never ceases to inform and entertain.